Nancy Bishop’s Journal is a repository for my thoughts on my various obsessions focused around popular culture and politics. My definition of popular culture is primarily rock and roll and its cousins and progenitors — R&B, blues, folk, country and jazz. Plus film, theater, television–and art, architecture and design, books, writers and writing. My explorations also will look at how new media are changing our cultural landscape. My political comments will generally be tied to the reflection of politics in popular culture — but not always. Full disclosure. 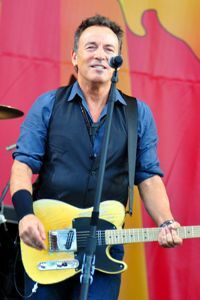 My primary obsession is with the music of Bruce Springsteen and his various incarnations — solo and acoustic, with the E Street Band, the Sessions Band and any other future bands he forms. The tagline under my blog title above is a Springsteen quote, identified on the About page. From time to time, I’ll explain my passion for Bruce’s music — and his politics. Oh, and anything Chicago. I’m a Chicago native from the northwest side neighborhood of Montclare, lived in other places for many years, but I’m here to stay. I love Chicago’s nasty, corrupt and illustrious history and politics, its architecture, its weather, its lakefront, its theater, its music and its writers. And I glory in seeing my city reflected in films and TV shows made in Chicago. First of all, I believe in the magic of rock and roll. Here’s what I said about that in my first post to my new blog. I also believe that it’s my right and duty as a writer and a human being to reflect on the things that are important to me in this blog — especially after 35 or 40 years of writing whatever my employer was interested in. So this blog is about me, me, me. As the late Roger Ebert said in his memoir, Life Itself, his blog taught him how to organize the accumulation of a lifetime. “It pushed me into first person confession, it insisted on the personal, it seemed to organize itself into manageable fragments.” For Ebert, his blog was the beginning of writing a memoir. Writing a memoir in fragments is not my intention here. But you never know. So all the things in the world that are important to me — and they can generally be encompassed under the umbrella of politics and popular culture — will be the province of this blog. Life is raw material. To start with, I’ll give you an idea of my personal interests with the post below on things I like and don’t like. It’s an homage to Susan Sontag, who reveled in lists. My lists are a work in progress. Films by Altman, Bunuel, Almodovar, Bergman, Smith (Kevin, that is), Kieslowski, Jim Jarmusch, David Lynch, Guy Maddin. And Christopher Guest, of course. Another mad genius. Novels by Jose Saramago, Philip Roth, Richard Powers, Mordecai Richler. Coincidentally they are all on one shelf in my fiction bookcase. Also Margaret Atwood, Michael Chabon, Timothy Findley and John Coetzee. I met your today after the Rick Kogan/Jon Langford presentation. I love your blog. I’ll definitely be reading it. Thanks, Bernice. Nice to meet you today. Hope the Greg Kot/Mavis Staples interview was as good as the Kogan/Langford session. I just read your Obsessions again. I chuckled with the silly plays and almost all musicals particularly after I just saw and loved An American in Paris.